Want to see what we've uploaded to the website? We load: Technical Materials, Biographies,Advertisements, Brochures, Press Releases/Photos & Magazines. Click the button below to see a week-by-week listing. Follow our coverage of car shows and events Nation-wide. Our reporters try to cover as meny event as possible each year. See what other people collect, show and drive for fun! Click on the button below to see what we cover. See Living History - other people's cars. Catch what fellow car enthusiasts are driving. We cover the car, the owner, and how it came to be in their possession. Click on the button below to see them. Read true stories about cars, drivers, activites & events. All by those who were "there". We've also gone "back in the day" and picked out material to add to the mix. Click on the button below to get in our time machine! Check out hot news on cars and the hobby. We stay on top of news that's important to you. AND we keep all stories "on file" in case you want to read about it later. Click on the button below to see what we're covering. the button below to see the Library. 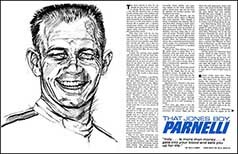 Read racing articles from magazines & publications of the time. We provide "back in the day" coverage of many races and events of the time. The list grows constantly. Click on the button below to get in our time machine! See stories on and about famous automotive greats. We collect and create stories on automotive personalities and even short biographiespublish "back in the day". Click on the button below to see who we've covered. See our Magazine Archive. The Archive has articles from automotive magazines. Each magazine article is stored as a file that you can download in PDF format. Click on the button below to see them. We at the Society write features, short stories, blogs, serials - and even novels. We post them in this special section and you get to enjoy the ride! Check out our current features! Click on the button below to see them. We Support Automotive Artists & Auto Writers. Our hobby has encouraged people to draw cars and write stories about them or a specific automotive subject. Click on the button below to see who we support. See our sponsored bloggers. Catch what your fellow car writers and bloggers are saying. We let them say their piece as long as it's not political, inflamatory or derogatory. Click on the button below to see what they're saying.